The magazine also offered a solution, suggesting that computers and IT resources be ensured first in order to “informationalize” economic management and administrative activities, and that communications equipment be modernized, stating that construction of basic facilities was an urgent task. In addition, program industries used in the economic sector should be developed, and planning, statistical, and accounting programs, in particular, need to be connected across the country. Along with this, the magazine noted that the development of information science is closely related to that of information technology, and that research efforts regarding information science need to be strengthened. The article called for further development of basic elementary management systems education, information theory research, and, of course, systems engineering, legal administration, and other economic science fields. “Informationalization” of economic management and administrative activities is based on IT resources, and focuses on automating statistical and accounting practices in order to strengthen economic management controls and to boost productivity and efficiency. 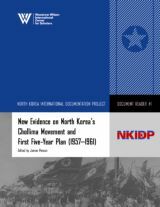 This week the Wilson Center’s North Korea International Documentation Project (NKIDP) held a conference on the DPRK’s chollima campaign and the first five year plan. For the conference, the Wilson Center published a collection of declassified archival documents. The volume consists of select (East) German, Polish, Chinese, and Czech archival documents that provides context for discussion on North Korea’s Chollima Movement, launched in the mid-1950s and recently revived by the North Korean leadership to make the DPRK a “strong and prosperous” state by 2012. The collection, compiled by NKIDP is by no means comprehensive, however, in selecting the materials, the editors sought to include some of the most important materials available and made a substantial effort to mine relevant official archives. The document reader is organized chronologically, starting with December 1956 and ending in May 1963. You are currently browsing the archives for the Chollima category.